The commercial use of electricity began in the late 1870s when arc lamps were used for lighthouse illumination and street lighting. 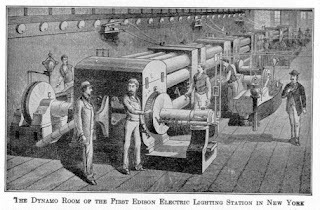 The history of the evolution of electric power system is discussed in this article. The first complete electric power system (comprising a generator, cable, fuse, meter, and loads) was built by Thomas Alva Edison – the historic Pearl Street Station in New York City which began operation in September 1882. This was a dc system consisting of a steam-engine-driven dc generator supplying power to 59 customers within an area roughly 1.5 km in radius. The load, which consisted entirely of incandescent lamps, was supplied at 110 V through an underground cable system. Within a few years similar systems were in operation in most large cities throughout the world. With the development of motors by Frank Sprague in 1884, motor loads were added to such systems. This was the beginning of what would develop into one of the largest industries in the world. In spite of the initial widespread use of dc systems, they were almost completely superseded by ac systems. By 1886, the limitations of dc systems were becoming increasingly apparent. They could deliver power only a short distance from the generators. To keep transmission power losses and voltage drops to acceptable levels, voltage levels had to be high for long-distance power transmission. Such high voltages were not acceptable for generation and consumption of power; therefore, a convenient means for voltage transformation became a necessity. The development of the transformer and ac transmission by L. Gaulard and J.D. Gibbs of Paris, France, led to ac electric power systems. George Westinghouse secured rights to these developments in the United States. In 1886, William Stanley, an associate of Westinghouse, developed and tested a commercially practical transformer and ac distribution system for 150 lamps at Great Barrington, Massachusetts. 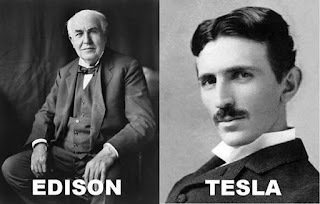 With the development of polyphase systems by Nikola Tesla, the ac system became even more attractive. By 1888, Tesla held several patents on ac motors, generators, transformers, and transmission systems. Westinghouse bought the patents to these early inventions, and they formed the basis of the present-day ac systems. In the 1890s, there was considerable controversy over whether the electric utility industry should be standardized on dc or ac. There were passionate arguments between Edison, who advocated dc, and Westinghouse, who favoured ac. Voltage levels can be easily transformed in ac systems, thus providing the flexibility for use of different voltages for generation, transmission, and consumption. AC generators are much simpler than dc generators. AC motors are much simpler and cheaper than dc motors. The ac versus dc controversy ended with victory for the ac system. In the early period of ac power transmission, frequency was not standardized. Many different frequencies were in use: 25, 50, 60, 125, and 133 Hz. This posed a problem for interconnection. Eventually 60 Hz was adopted as standard in North America, although many other countries use 50 Hz. The increasing need for transmitting larger amounts of power over longer distances created an incentive to use progressively higher voltage levels. The early ac systems used 12, 44, and 60 kV (RMS line-to-line). This rose to 165 kV in 1922, 220 1W in 1923, 287 kV in 1935, 330 kV in 1953, and 500 kV in 1965. Hydro Quebec energized its first 735 kV in 1966, and 765 kV was introduced in the United States in 1969. To avoid the proliferation of an unlimited number of voltages, the industry has standardized voltage levels. The standards are 115, 138, 161, and 230 kV for the high voltage (HV) class, and 345, 500 and 765 kV for the extra-high voltage (EHV) class. With the development of mercury arc valves in the early 1950s, high voltage dc (HVDC) transmission systems became economical in special situations. The HVDC transmission is attractive for transmission of large blocks of power over long distances. The cross-over point beyond which dc transmission may become a competitive alternative to ac transmission is around 500 km for overhead lines and 50 km for underground or submarine cables. HVDC transmission also provides an asynchronous link between systems where ac interconnection would be impractical because of system stability considerations or because nominal frequencies of the systems are different. The first modern commercial application of HVDC transmission occurred in 1954 when the Swedish mainland and the island of Gotland were interconnected by a 96 km submarine cable. With the advent of thyristor valve converters, HVDC transmission became even more attractive. The first application of an HVDC system using thyristor valves was at Eel River in 1972 – a back-to-back scheme providing an asynchronous tie between the power systems of Quebec and New Brunswick. With the cost and size of conversion equipment decreasing and its reliability increasing, there has been a steady increase in the use of HVDC transmission. Interconnection of neighbouring utilities usually leads to improved system security and economy of operation. Improved security results from the mutual emergency assistance that the utilities can provide. Improved economy results from the need for less generating reserve capacity on each system. In addition, the interconnection permits the utilities to make economy transfers and thus take advantage of the most economical sources of power. These benefits have been recognized from the beginning and interconnections continue to grow. Almost all the utilities in the United States and Canada are now part of one interconnected system. The result is a very large system of enormous complexity. The design of such a system and its secure operation are indeed challenging problems.